ST Foundation gave emphasis in 2012 to maximize the impact and efficiency of its key program, the Digital Unify, which has the goal to help bridge the digital divide: the gap between those who have access, and those who do not, to modern digital technologies. 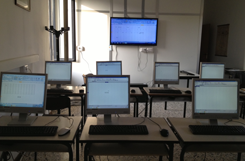 The Digital Unify offered free computer access and training to over 176’443 beneficiaries since its inception and as of 2012. On May, 29 2012 ST Foundation’s Board members met in order to review the progress made on various fronts. In addition, they approve the participation of a new member, effective August, 1 2012. Board members and ST Foundation’s staff have warmly welcomed Mr. Patrice Chastagner onboard the Foundation. 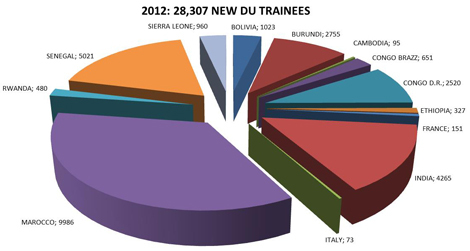 1“The reduction in 2012 of the number of trainees was due to the running out of old program in Sierra Leone and Senegal while the new program based on the Model Lab approach have not jet started. We expect in 2013 to be over the 40.000”. In February 2012 Board members met in order to review the progress made on various fronts and approve the hardware purchasing plan according to the Model Lab approach for the equipment of new labs in Sub Saharan Africa. Following a productive discussion, the Board agreed to a two axis strategy: to target certain new countries in Sub-Saharan Africa while, at the same time, to strongly refresh and accelerate ST Foundation’s activities in ST countries such as the Philippines and India in order to reach the highest number of trainees. The Local Communities initiative aims at creating one group of volunteers in each ST site that can contribute to the Foundation’s activities. Scope of Local Communities is to set up a Digital Unify lab where ICB courses will be held, for the outside communities around ST sites. During the month of May following a good coverage of the initiative on internal media, posters have been prepared by ST volunteers and have been distributed to increase the buzz around the project and help launch new ST volunteers’ groups around the world. In order to present the Foundation and the Digital Unify program to potential partners and to anyone interested in our activities, it was decided to prepare an official leaflet. In order to boost the sense of belonging to the ST Foundation cause, with the support of our Indian Liaison Office, we worked on a new T-Shirt to be distributed among our trainers in all 20 countries of operations. This idea goes along well with the intention of creating a community that share our ideals. The T-Shirt is a little tool, to be used along with a dedicated Facebook profile, where we created two ad hoc groups for teachers and volunteers to help them sharing ideas and provide feedback to our activity. The Model Lab approach is in 2012 the new strategy tool for ST Foundation projects. Its implementations has demonstrated to allow lower costs and more efficiency. The Model Lab Working Group, based in Agrate, has equipped in March a Thin Client lab based in a storage room which was offered by the ST site management for the scope. The lab has allowed to carry out tests to verify the exact consumption of a standard Model Lab based on a thin client approach and the functioning of a complete lab of 10 clients using the Ncomputing Thin Client boxes. The tests also exanimated exactly how long the batteries can ensure power supply in case electricity is suddenly missing. The assembly of all components and the testing activity have been completed. Solar panels can now offer a valid alternatives for labs situated in remote areas where electricity is not available. All these activities have allowed the Foundation to purchase the best equipment for the labs based on the Model Lab approach and to organize the first sending of hardware to Africa. In December the ST Foundation was ready to buy and ship the equipment for: 8 Labs in Congo; 10 Labs in Sierra Leone; 12 Labs in Senegal. During 2012 it was brought to the attention of the Foundation the fact that in some countries, like Congo and Burundi where our target audience has barely ever seen a computer, the ICB manual in use was too difficult and complicated. Moreover the standard duration of the course, that is of 20 hours, could not be always respected. Therefore Pietro Fox decided to develop a new tool, with the support of an expert of educational techniques in developing countries, much more adequate to the local needs. This new manual has been tested in Burundi and the results were excellent, therefore it has been decided to go on using this document for the other Sub-Saharan countries. In May Pietro Fox travelled to India and Philippines in order to review and support existing and future DU activities in the context of the Local Communities initiative. During his stay in India, Pietro met with the DU volunteers in Greater Noida, reviewed the status of DU India, visited potential partners for future expansion and made recommendation to improve the efficiency and quality of the DU program. During his stay in the Philippines, Pietro met with ST Calamba Site Manager, Melba, who is strongly supporting DU kick-off, Leah Cruz (Calamba CSR) and with an initial core of DU volunteers. He visited three suitable sites and met with potential DU partners. He suggested a road map for setting up a new Local Community in Calamba including the training of local DU volunteers by Indian ST colleagues and the set-up of an internal DU lab, together with external labs to be established once the most suitable partners are identified. This trip to Asia proved very profitable for DU reinforcement and expansion and brought to the decision of the Board on November 6th to open a new liaison office in the Philippines An ICBF (Train the Trainers session) animated by Indian ST volunteers was scheduled in week 39 and took place at ST Calamba. The Session was really successful and now we are pleased to say that we have 12 new teachers that can support the DU Cause. 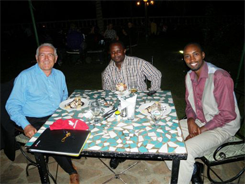 Board member Mauro Decca, in April, visited Burundi to advance the signature of the Convention with the Ministry of Education. Thanks to the visit the Ministry of Foreign Affairs and the Ministry of Education approve ST Foundation application for the recognition as an NGO. During Mauro Decca’s visit in Congo D.R., he reviewed 8 new potential schools for DU expansion. Budget has been defined with our partner MLFM. Chhavi Bajpai and Jyoty Chopra from ST Greater Noida coordinated all the sessions of the training Test lab set up to verify the performance of the new standards labs, implemented in an organization dedicated to assist old people near the ST Agrate site.